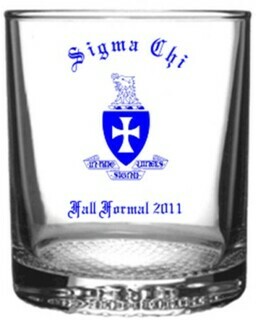 Create your own masterpiece by ordering a custom printed 14-ounce collectors glass from Greek Gear. The customizable 14-ounce collectors glasses make great souvenir items for formals, chapter events and more. Because these glasses are custom printed, each one is a collector's item. The glasses feature weighted bottoms, straight sides and clear glass that better shows off the printing. Glasses are precision-printed in one color only. Our 14-ounce custom printed glasses also make great favors for weddings, bachelor or bachelorette parties, family reunions and more! Ready to get started? Click on the blue "Customize This Product" button to enter our convenient online design system. 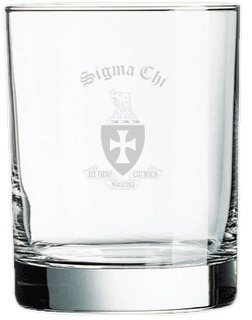 We have a variety of crests, Greek letters and clip art to choose from to help you create your own glassware design. 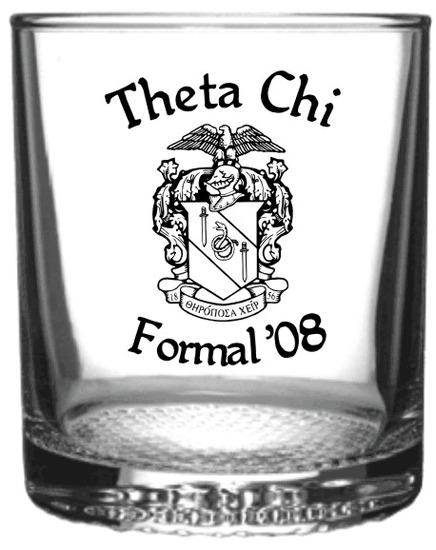 Bulk discounts are available on these glasses and there is a low 12-piece minimum order. Need us to do the creating? Just let us know your specifications and we'll create a proof that will be ready for approval in just one working day. Please note that there is a $40 setup charge and 36-piece minimum on all custom glassware orders. Printing is in one color only.